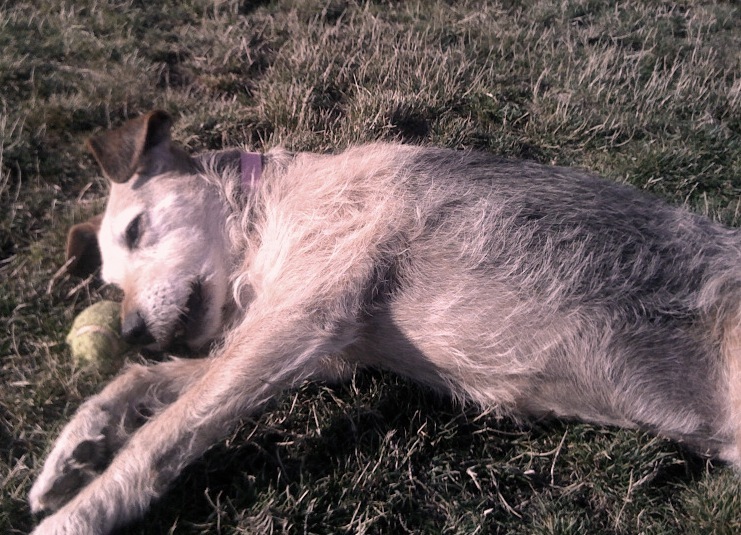 Franny found this ball at the park and went crazy with it, rolling around like a dog 1/4 her age. In her last 36 hours, Franny was only a shadow of her self but I don’t want to remember her that way; I want to remember her as the dog she really was. Franny loved the outdoors. I suppose most dogs do but for a 12-year old with cancer, she was surprisingly active. Because I work from home, we had the great fortune of being able to explore San Francisco’s open spaces on a regular basis. Her favorite place, without a doubt, was Baker Beach. The first time I took her there was the first time I saw her in a full-out bounding gallop of happiness. She didn’t like the water – she would trot away from the waves if they got too close – but she loved the sand and the smells and the tiny little crabs that would wash ashore. 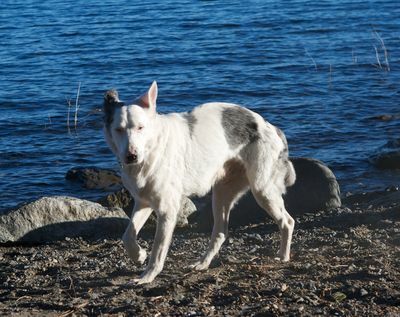 On the beach she chased balls, running after them with gangly adolescent legs she never grew out of. Recently we discovered Glen Canyon and she loved traipsing around the hillsides and digging in animal holes. Franny’s smile was infectious. We were regularly stopped on the street or at the park by people telling me how cute she was. Like all dogs, she loved stinky stuff and when she would roll in a smelly spot in the grass, legs akimbo, she looked like a puppy. If Franny were a human, I’d call her a foodie, always in search of yummy remnants in the park and on the street. Franny loved her treats and demanded them with her barks. If anyone else in the park had them, she would run over and sit nicely in front of them, straining for a piece. She loved bully sticks and regular sticks and chomped them down with abandon. Franny fancied herself as an enforcer. If the cats got too rowdy, she gave them a closed mouth growl that, to my ears, was totally goofy and useless. 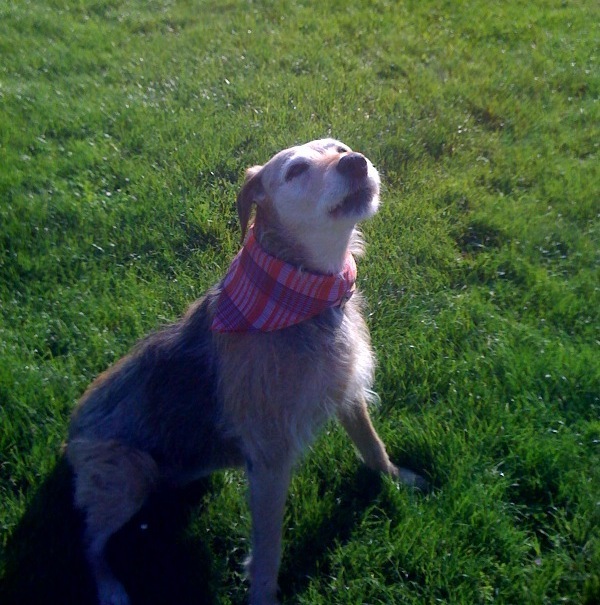 In the park, she would join in any good barking session. 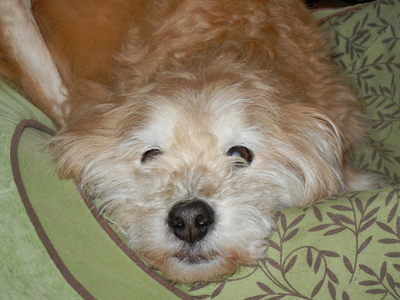 Franny liked her space – she didn’t like sleeping on my bed or sitting on the couch – but she always kept me in her sights. She was never so happy as when she was off-leash. 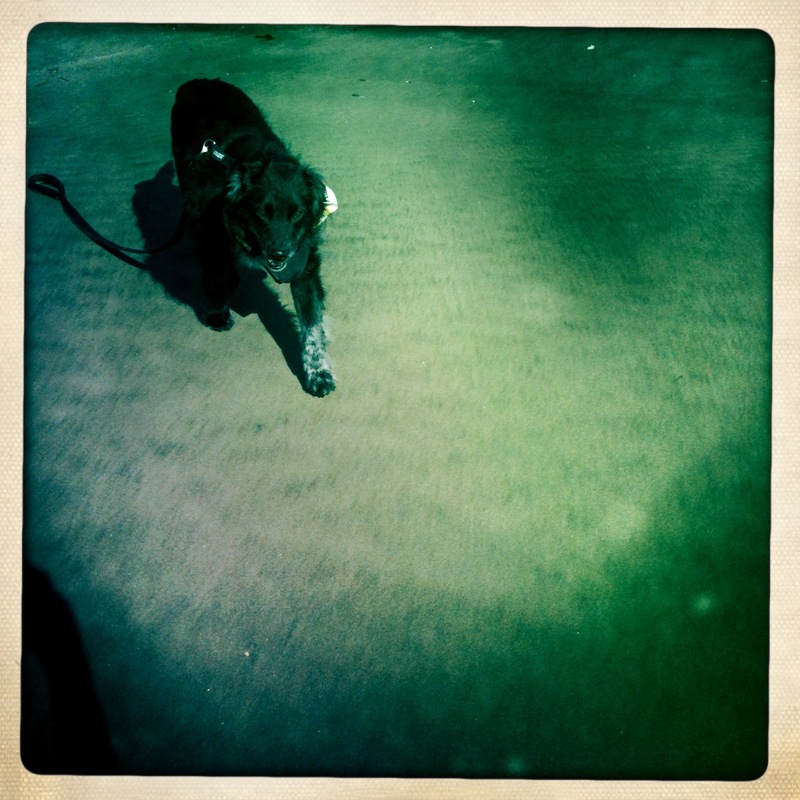 When she wasn’t distracted, Franny stayed right by my side; we even occasionally walked on the street without a leash. Whenever I could, I brought her with me – to picnics, to dog friendly bars, to concerts, to dog-training class. Not many dogs like hugs, but Franny wasn’t one of them. If we were in a strange situation or if I had just come home, she would walk up and lean her forehead in to me. One of the cutest things Franny did was her nightly face scratching in which she used her front paws to rub her nose. Sometimes she brought up a hind paw to scratch her ears but it was almost like she was putting on a show rather than doing anything useful, her nails hardly touching herself and her hind leg moving slowly. 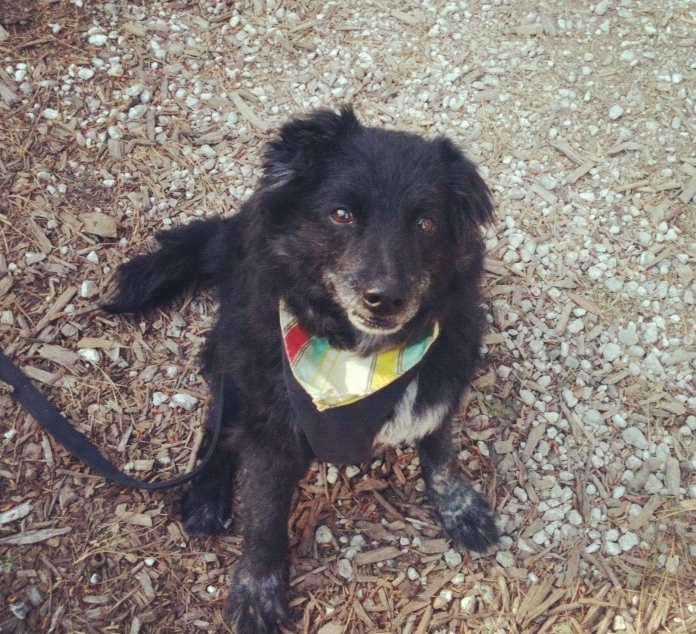 All her life, Franny was a sweet, soulful creature and everyone that met her fell in love. She was my friend and my heart. I will remember her always. 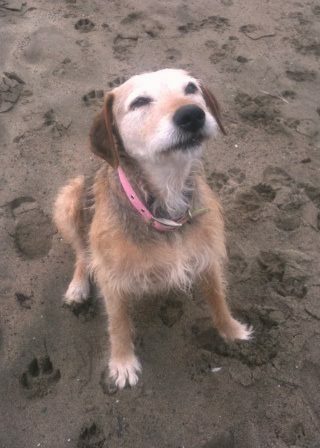 Franny at Baker Beach.This is where I will scatter her ashes when she is returned to me. Franny didn’t get along so well with our last Muttville foster dog, Dusty, but so far so good with our weekend charge Layla. Layla was adopted last week but, when a gastrointestinal bleeding issue returned, the woman decided she wasn’t equipped to handle it and returned Layla to Muttville. Her return coincided with a perfect storm of the Muttville staff’s exodus to the No More Homeless Pets National Conference in Las Vegas so, Friday morning, I got a call from Anne at the office asking if there was any way I could take Layla in for the weekend. Since I am a sucker for fosters and a huge supporter of Muttville, I immediately agreed. 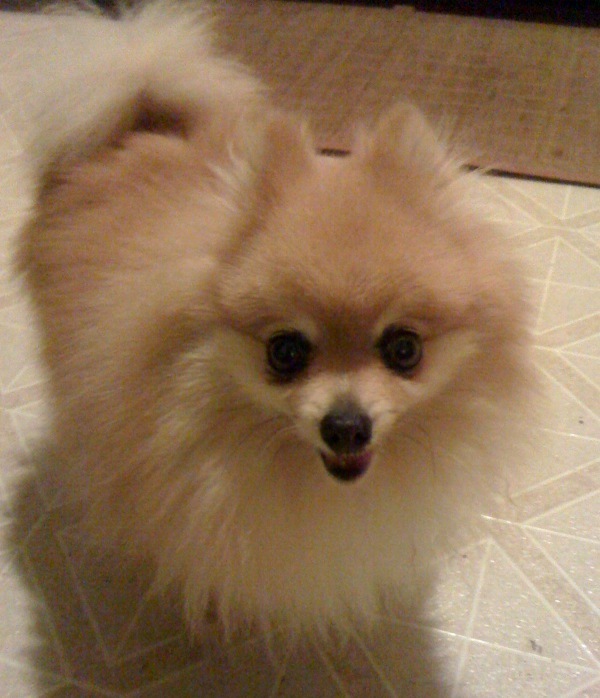 Anne told me Layla was a pom, and the last two foster poms I had were amazing little creatures (one, Debbie – a toothless old lady – to this day remains my favorite…beside Franny, of course). I’m using some of the advice I learned from our experience with Dusty and things are mellow. I think I will foster Layla until she has found a new home…but, as with any foster, the faster she finds her new forever home, the happier she will be! Layla is around 7-8lbs and a major fluff bucket. She has beautiful apricot fur that takes over everything but her tiny little feet, the tips of her ears, and her pretty face. Layla has very nice manners. She walks well on a leash and is very people friendly. She is a bit shy around other dogs but warmed up to Franny very quickly. She is great cats and sweet as can be. Layla is puppy pad trained and housebroken. She’s energetic and playful but not bouncing off the walls. She loves to “den”, fall asleep under furniture. I’m not sure how old Layla is but I’m guessing around 9-10yrs. If you or someone you know is interested in adding a gorgeous little lady to their lives, please contact me or visit www.muttville.org! 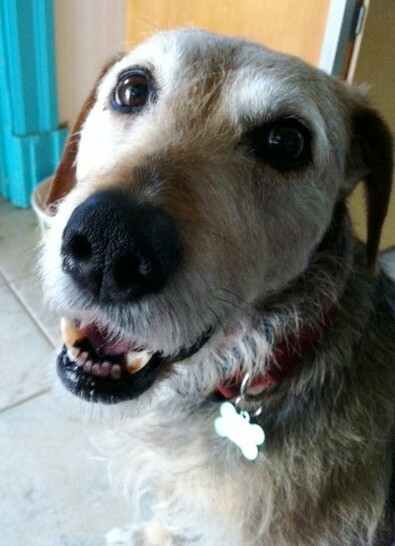 Walter is a 10yr old terrier mix available for adoption at http://www.muttville.org! 1. Changes in mobility such as lameness, reluctance to jump, and/or difficulty getting up. 2. Excessive water drinking and urination, without changes in energy level. (Can indicate diabetes or changes in kidney function). 3. Changes in appetite, diminished or no appetite; aggressive eating. 4. A hacking cough or a deep moist cough. 5. Weight loss not related to exercise or dieting. 7. Vomiting and/or diarrhea for more than 3 days. 8. Behavioral changes such as anxiety, circling, vocalizing, uncharacteristic aggression, or confusion. 10. Emergence and rapid growth of any lumps. If you notice any of these changes in your older dog, don’t ignore them and do not attempt to self-medicate your pet. Visit your vet as soon as possible.